Is it a good Idea to drink grape sap if you have no clean water? In spring, the grape vines are so full of watery sap that a cut from my pocket knife causes it to trickle out fairly fast, and it can be collected in a container. Someone told me that it is a good substitute for water on a trip, because it is purified by the plant. Is this true? I'll give this a stab, but there aren't any authoritative sources that I've managed to find on the subject! The most I could really find are examples such as this one where people have drank it and felt no ill effects, and I haven't found a documented case of anyone drinking it and it being harmful to them. From a biological point of view the vine will at least partly purify the ground water, though if it's a known heavily contaminated area I wouldn't take it as a substitute for a proper water filter. In terms of the effect on the grape vine, most sources I've found seem to show that while it seems alarming it's actually not that bad for the vine, though obviously if you make cuts everywhere and drain all the sap there will come a point where it won't be able to sensibly recover. In short, if you're really desperate for water and it's the only source available in a survival situation, I'd see no great reason for not giving it a try. It isn't however a direct substitute for a good, purified water source. I cut new growth back and stick the dripping ends in a container. Sap collects quickly and after filtering through a coffee filter it is absolutely clear and tastes refreshing. Never had any health problems from it and the grapevine doesn't even notice as it's a huge vine. Stay away from the main shoots and just nip the new growth back. The vine actually produces better grapes as a result. If you want to avoid bird droppings etc from getting in your container, place a cloth over the top. 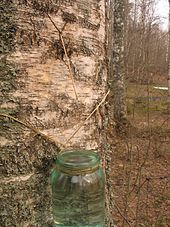 I'm not sure about grape sap but I can tell you that birch sap is great and has no ill effects. You can collect it quickly and easily in the break of winter/early spring and it contains heterosides (betuloside and monotropitoside), 17 amino acids including glutamic acid, as well as minerals, enzymes, proteins, betulinic acid and betulin, antioxidants, sugar (xylitol, fructose and glucose) and vitamins (C and B). I have drank it. These were the big vines that grew to the top of trees. Just cut them & let the water flow into a collector below. Wild grapes here not domestic. I had no ill effects from this. This was in a swamp area that was under water 3 to 4 months a year. So safer than other water avalable at that time. Not exactly grape sap, but a local merchant to me is selling what he calls Organic Water. The source is the liquid evaporated off during the Maple Syrup manufacturing process. Because the source is filtered by the tree, aka a plant source, he was able to get it legally recognized as organic. Honestly , I have done this before and it feels really good and makes your whole mouth feel refreshed. We live near a creek , so , it's usually pretty wet and the grape vines are everywhere. I have noticed that it as a slight plant like taste to it. But I honestly like it. I hope this helps. Not the answer you're looking for? Browse other questions tagged water plants or ask your own question.